Frontend (FE) ports act only in target-only mode. These ports will be disabled, if you stop a DataCore storage server. Mirror (MR) ports (can) act as target AND initiator. You can set (if you like) a mirror port to a specific mode (target or initiator), but I wouldn’t recomment this. Theoretically you can set one MR port to act as initiator, and a second to target-only mode. If the port is set to target-only, the port is also stopped when the DataCore storage server is stopped. A backend (BE) port acts as initiator for backend storage. Usually the FE ports act as target-only, the MR as target/ initiator and the BE ports as initiator-only. If you use local storage (or SAS connected), there will be no BE ports. You check the chosen backend paths and manually select one (!) active and optimized path. You replace the DataCore drivers for the backend ports and use Microsoft MPIO to handle the backend paths. Solution 1 is okay if you only have a few backend disks. DataCore also uses the Microsoft Windows MPIO framework, so it’s available by default if you install DataCore SANsymphony-V. DataCore allows the usage of 3rd party MPIO software (like EMC PowerPath), but they will never support it. If you have trouble with you backend connection, you will be on your own. Using a Third Party Failover product (such as EMC’s PowerPath or the many MPIO variants from Storage Vendor) can be used directly on the DataCore Server. In the case where Storage Arrays are attached by Fibre Channel connections, do not use the DataCore Fibre Channel back-end driver when using any Third Party Failover product – use the Third Party’s preferred Fibre Channel Driver instead. A Storage Array that is connected to a DataCore Server but without using the DataCore Fibre Channel back-end driver can still be used. This includes SAS or SATA-attached, all types of SSD, iSCSI connections and any Fibre Channel connection using the Vendor’s own driver. Any storage that is connected in this way will appear to the SANsymphony-V software as if it were an ‘Internal’ or ‘direct-attached’ Storage Array and some SANsymphony-V functionality will be unavailable to the user such not being able to make use of SANsymphony-V’s performance tools to get some of the available performance counters related to Storage attached to DataCore Servers. Also some potentially useful logging information regarding connections between the DataCore Server and the Storage Array is lost (i.e. not being able to monitor any SCSI connection alerts or errors directly) and may hinder some kinds of troubleshooting, should any be needed. You should replace the backend drivers AFTER the installation of SSV, but BEFORE you map storage to the newly installed storage server. To identify the correct FC-HBA or NIC, take a look at the PCI bus number. You can find this information on the info tab of the server port details in the DataCore SSV GUI. 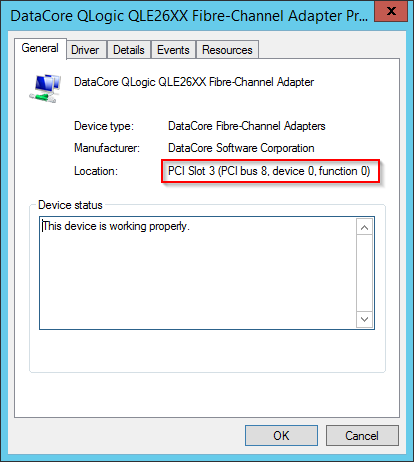 Then check the FC-HBA/ NIC in the Windows device manager for the same PCI bus number. 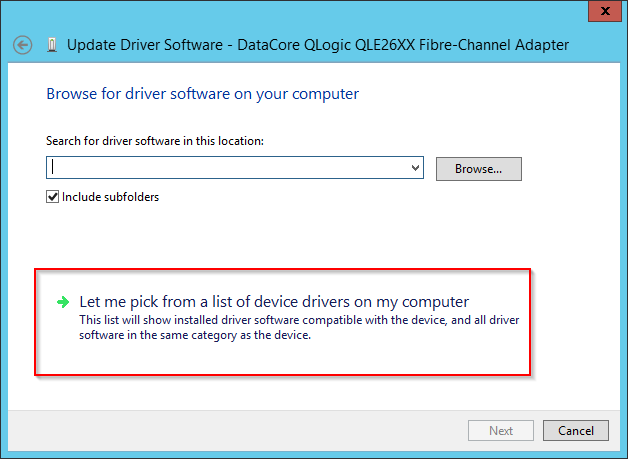 Switch to the “Driver” tab and replace the DataCore driver with the native HBA driver. mpclaim –r –i –a ""
Somethimes the storage vendor offers monitoring tool (this is from Nexsan) that provide information about path state, mpio policy and statistics. I can’t see much reasons to use the DataCore drivers and the native backend path handling from SSV. But you should be clear about the limitations when it somes to support! 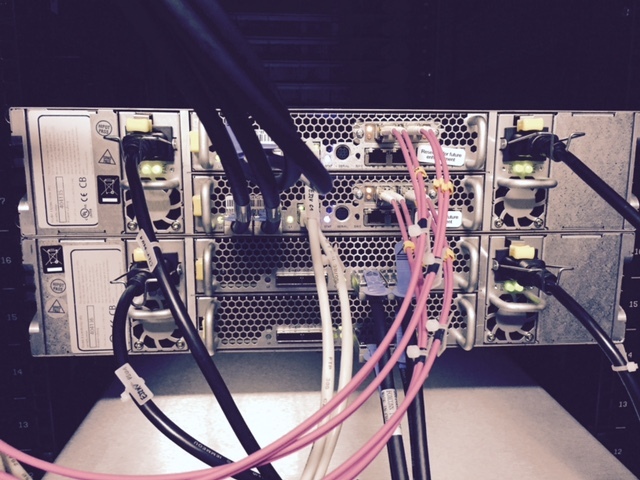 This entry was posted in Storage and tagged datacore, storage on August 29, 2015 by Patrick Terlisten. One of my longtime DataCore customers has started a project to replace their current DataCore storage servers and backend storage with new hardware. In opposite of the current setup, the newly installed backend storage is now FC-attached. The customer has selected Nexsan E-Series E32V, E32XV and E48V storage systems in combination with DataCore SANsymphony-V10. The question should be: Who is Imation? Nexsan was founded in 1999 in Derby, England, but was aquired by Imation in December 2012. Since December 2012, Nexsan is one of Imations brands and offers, as a storage-only company, three different product lines: Assureon Secure Storage, E-Series High Density Storage and NST Hybrid Storage. Assureon Secure Storage is amied to customers that needs to implement storage optimization, regulatory and corporate compliance, and/ or long-term archiving of unstructured data. NST Hybrid Storage offers unified storage and access to it using standard NAS and SAN protocols (CIFS, NFS, FTP FC, iSCSI). It also offers high scalability and Imation’s FASTier caching technology to provide performance for mixed application workloads. The E18XV, E32XV, E48XV and E60XV are the corresponding expansion enclosures. You can add up to 2 enclosures to a so called head unit. All models support 3,5″ disks (or 2,5″ in a 3,5″ cage), except the E32(X)V, which offers only support for 2,5″ disks. You can mix different disk technologies (NL, SAS, SSD) in a single system. All controllers offer 1 GbE iSCSI ports (up to 8 ports per controller pair). There is also support for 6G SAS, 8 Gb FC, 16 Gb FC and 10 GbE iSCSI (up to 4 ports per controller pair). All E-Series support array-based snapshots and replication. The E60V with two enclosures can hold up to 1.44 PB (!) on 12U. Why choose Nexsan E-Series storage as a backend for DataCore SANsymphony-V? My first two thoughts were “Where are the cool features, like thin-provisioning, tiering etc. ?” and “Oh cool, 32 disk on only 2U/ 48 disks on 4U”. And I think this ultimately describes the benefits of the Nexsan E-Series: No unnecessary frills and high capacity. To be honest: The main reason for using dumb SAS JBODs in the past was, that they doesn’t offer unnecessary frills. I don’t need snapshots, replication or thin-provisioning on array level. These features are offered by DataCore SANsymphony-V. 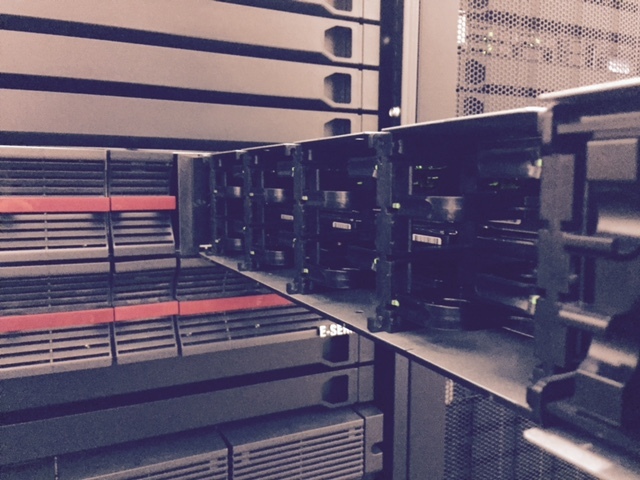 In this case, the customer has chosen to switch from a SAS to a FC-attached storage backend. And in this case, a high performance and high density storage without unnecessary frills is the best thing that can happen. 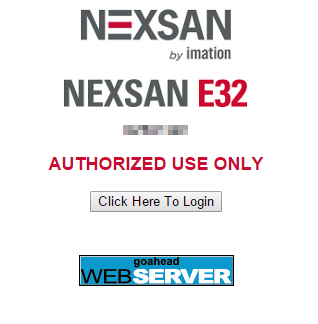 Disclaimer: I’ve never worked with Nexsan before, and they do not pay me for this blog post. The delivery came directly from Nexsan, Derby. Six pallets, one pallet for each system (2x E32V, 2x E32XV and 2x E48V). The enclosure and disks were packed separately, but in the same package. The packaging was adequate and it was all neatly packed and well padded. Each system was intensively tested by Nexsan before the shipment. The first step was to mount the rail kits. The rail kits are very solidly built and partially milled from aluminum. Mounting the rail kits was an easy thing using the included template. You have to use the enclosed screws. Unfortunately no screwdriver-less mounting. The rails were anything but smoothly. And it was a precision job to mount the enclosures. But to be honest: How often do you rack the enclosures? One time. Each controller has a management port. The first controller has the ip address 10.11.12.13/8, the second controller 10.11.12.14/8. Simply hook up your laptop and connect to one of these IPs. You don’t need login credentials at this point. But you better should assign a password for the ADMIN (case-sensitive!) after finishing the installation. If you have multiple Nexsan storage arrays in your network, please make sure that have connected only one system at one time. All Nexsan E-Series storage arrays use the same default ip addresses. The Nexsan E-Series is a classy dual-controller storage. This is a picture of a E32V. As you can see, 16 hard drives are mounted in one drawer. Nexsan’s so called ActiveDrawer Technology allows you to service disks and both fan units (one at the front and one at the end of the drawer) online. All important components are hot-swappable. The expansion unit E32XV uses the same technology as the E32V. But instead of two controllers, the expansion enclosures has two IO modules. This is the back of the E32V with the SAS-connected E32XV. This is a E48V with one pulled out drawer. It also uses the the ActiveDrawer Technology. The controllers are nearly the same, but they have 8 GB cache instead of 4 GB. The GUI is really puristic and fast. Pure HTML with a bit Java Script. You can enable HTTPS if you like. I haven’t noticed any problems with different browsers. The home page gives you a brief overview about the hardware status. The storage arrays are coming with pre-build RAID arrays and volumes. If you want another setup, simply use the Quick Start feature. Simply enter the number of RAID sets, spares and volumes and the wizard make the rest. One very cool feature is the multi view. Multi view allows you get a quick overview over multiple E-Series storage arrays. The same applies to the RAID info page. Nice: Disk and hosts stats! Very handy. For our DevOps friends: Each controller offers a config dump page which is plain text and can parsed by a monitoring system or script. The E-Series offers all necessary monitoring features, like e-mail notification, SNMP, Syslog etc. If technical support is needed, the GUI offers a “Technical Support” page which can be used to open a support ticket right from the GUI. I can’t say anything bad about the Nexsan E-Series. Sure, this is not a HP 3PAR, but should it? It’s a solid block storage and it’s a perfect fit with DataCore SANsymphony-V. The look and feel of the hardware is quite good. Good quality designed in UK. Make sure that you take a look at Nexsan if you’re searching for a solid DataCore backend storage. Patrick Schulz has also some experience with Nexsan and DataCore. Check out his blog posts about DataCore SANsymphony-V and Nexsan! 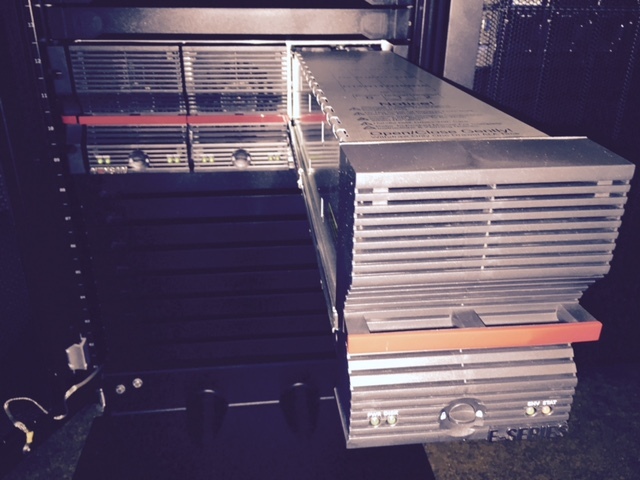 This entry was posted in Storage and tagged datacore, nexsan, storage on August 26, 2015 by Patrick Terlisten. 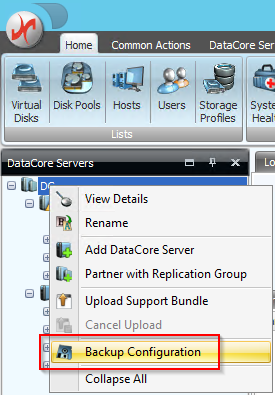 You can take the backup with the DataCore SANsymphony-V Management Console by right clicking the server group and then select “Backup Configuration” from the context menu. The Cmdlets take the configuration backup for all servers in the server group! Make sure that you copy the configuration backups to a safe location. Make sure that you copy a valid backup of each server in the server group. On thing is important: If you take the backups online (DataCore Storage Server is running! ), then you will see full recoveries in case of a restore. If you plan to reinstall a DataCore Storage Server, stop the DataCore Storage Server and then take the configuration backup. In case of a clean shutdown, only log recoveries will be necessary. Disconnect backend and mirror ports before you reinstall the OS! 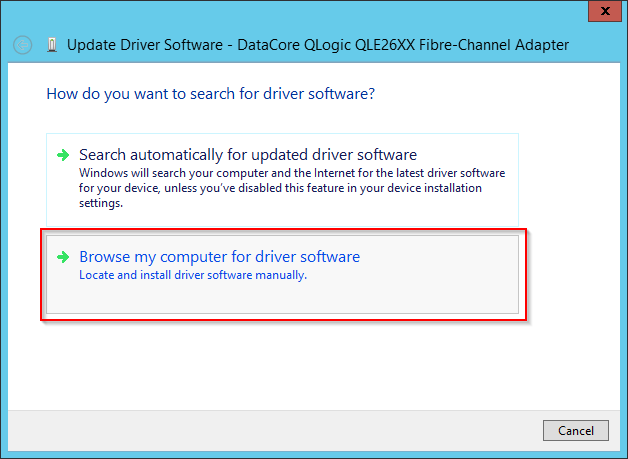 Install the Windows OS according to the DataCore guidelines (meet the prerequisites, read the know errors with 3rd party components PDF, check name resolution etc.). Make sure that you install the same build of DataCore SANsymphony-V that was used prior the reinstallation. Don’t install newer or older builds! Install exactly the build that was used when taken the configuration backup. Create the folder structure “C:\Program Files\DataCore\SANsymphony\Recovery” and copy the ZIP file into it. Start the DataCore SANsymphony-V installation. You will be prompted during the installation, that a saved configuration was found. If not, log a call at DataCore or follow the instructions in the DataCore online help. You also need the DcsAdmin password during the installation! I hope you have written it down somewhere. ;) After finishing the installation, shutdown the server and reconnect backend and mirror ports. Power-on the server and open the SANsymphony-V Management Console. If everything’s fine, start the DataCore Storage Server and watch the mirror recoveries. 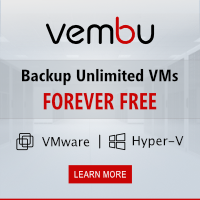 Take a configuration backup and support bundles. Proceed with the next servers in the server group. The process is quite simple. If you’re unsure about the correct steps, log a call at the DataCore support or take a look into the DataCore online help. Don’t try in-place upgrades to update the OS. I also don’t recommend to take images of running storage servers. Just reinstall the OS and use configuration backups to restore the configuration. 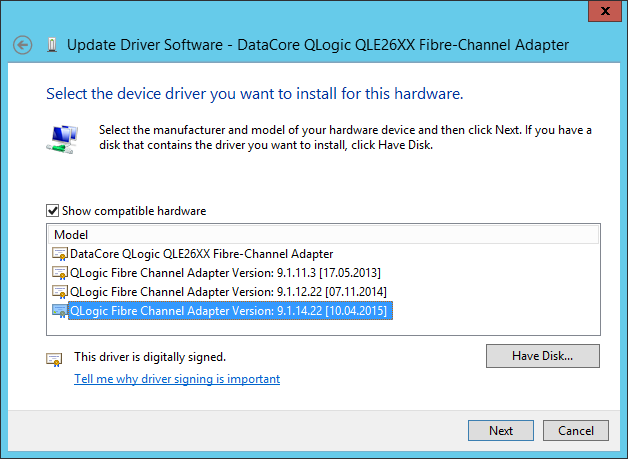 This entry was posted in Storage and tagged datacore, storage, windows on March 9, 2015 by Patrick Terlisten. This is only a short blog post. Just got an e-mail from the DataCore Support. They found a critical bug in SANsymphony-V 10.0.0.0 which should be fixed with Update 1. Only VMware customers are affected, because the bug is related to VMware Thin Provisioning Thresholds. Update 1 is planned for early September 2014. If you’re running SANsymphony-V 10.0.0.0 open an incident at the DataCore Support to get an available hotfix. If you have planned to update to SANsymphony-V 10, delay this update until the release of SANsymphony-V 10 Update 1. 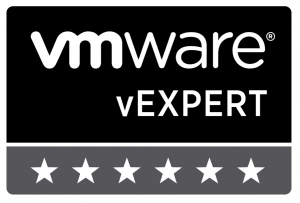 This entry was posted in Storage and tagged bug, datacore, sansymphony-v on August 14, 2014 by Patrick Terlisten. Today DataCore announced their latest SANsymphony-V release. After the merge of SANmelody & SANsymphony, SANsymphony-V10 is the 10th generation of DataCores flagship product. Interestingly DataCore uses the terms “software-defined” and “Virtual SAN”. Whether the product of the definition of the terms corresponds everyone should decide for themselves. But this is another story. What DataCore definitely does is automating and simplifying storage management and provisioning. I really like it the simplicity. DataCore SANsymphony-V can deliver enterprise-class functionality, like synchronous mirroring, replication, snapshots, clones, thin-provisioning and tiering . It runs on x86 hardware with Microsoft Windows Server 2008 or 2012. Multiple servers can grouped together for load balancing and redundancy. A storage pool can created out of the internal or external flash and roting rust. Single or mirrored virtual disks can be carved out of this storage pool. Hosts can access these virtual disks using iSCSI or Fibre-Channel. Because DataCore SANsymphony-V10 can use several different technologies as backend for storage pools, it’s easy to replace backend storage. You can add or remove disks to or from storage pools. If you backend storage is an old EMC CLARiiON and you get a new HP MSA 2040 Storage, you can replance the old storage without disruption. Along with new feature DataCore has announced is a new licensing model. Aside the traditional server license, there will be a Virtual SAN license which includes tiering, adaptive caching, storage pooling, synchronous mirroring, thin provisioning and snapshots/ clones. Both variations, the traditional SANsymphony-V10 and the Virtual SAN, running on Windows Server 2012. So the Virtual SAN will not be a virtual appliance. AFAIK it will only be a special license. The general availability is scheduled for May 30, 2014. So stay tuned. :) I hope to get SANsymphony-V10 as fast as it’s possible into my lab. This entry was posted in Storage and tagged datacore, storage, virtualization on April 29, 2014 by Patrick Terlisten. Problem: SANsymphony 9.0 PSP4 Update2 failed to update configurations with shared pools on DataCore Servers running SANsymphony 9.0 PSP3, PSP3 U1 or PSP3 U2. Cause: An upgrade script run during installation expected a cmdlet parameter that wasn‟t supported in these versions. Resolution: Updated the script to no longer rely on this parameter. Problem: A system crash in the storage pool driver could occur when using space reclamation on a virtual disk whose size had been reduced or in rare cases where certain I/O operations associated with space reclamation failed. Cause: An I/O completion routine was implemented incorrectly. Resolution: A code change was made to the completion routine to correct the issue. Problem: In specific scenarios where a mirrored virtual disk is in an unhealthy condition and is the source disk of an in-progress ESX virtual machine migration, third party XCOPY commands could copy stale data to the destination disk. Cause: XCOPY commands were incorrectly allowed to succeed even though a VM source or destination volume was marked as inaccessible to a host. Resolution: Fail these commands appropriately when the virtual disk is not healthy. Customers that are still run DataCore SANsymphony-V 9.0 PSP4 Update 1 or an earlier release are highly recommended to update to the latest release. Customers that run Update 2 can take actions to avoid two of the three issues. Customers that run update 2 shouldn’t resize volumes and they should disable VAAI before doint a svMotion. In my opinion both actions will not avoid to update to Update 3. The action can save up to over a certain time window, until the update 3 can be installed. This entry was posted in Storage and tagged datacore, storage on February 14, 2014 by Patrick Terlisten. Yesterday I got an e-mail from DataCore in which Update 2 for DataCore SANsymphony-V PSP4 was announced. DataCore found a critical issue in all releases since SANsymphony-V 9.0 PSP3. According to the releases notes a situation can occur, in which storage space reclamation and migration can happen at the same time. This can lead to a situation in which two storage allocation unit (SAU) can point to the same disk offset. If this happens, the disk pool can be marked offline. From my point of view only those customers are directly affected that use DataCore Auto-Tiering. Nevertheless I recommend to all DataCore customers to update to the latest SANsymphony-V release. You can download the latest release from the DataCore Support Portal. The update can be done online if you have a mirrored DataCore enviroment. Update: Patrick mentioned in his blog, that SAU migration can also occur in other situations, e.g. adding or removing disks to or from a disk pool. The space reclamation starts as soon as a virtual disk is deleted or SSV detects a all zeroed virtual disks. So deleting a virtual and adding a physical disk to a pool can also lead to a offline disk pool. Thanks to Patrick for clarification. This entry was posted in Storage and tagged datacore, storage on January 28, 2014 by Patrick Terlisten.